Amazing features with lightning fast. 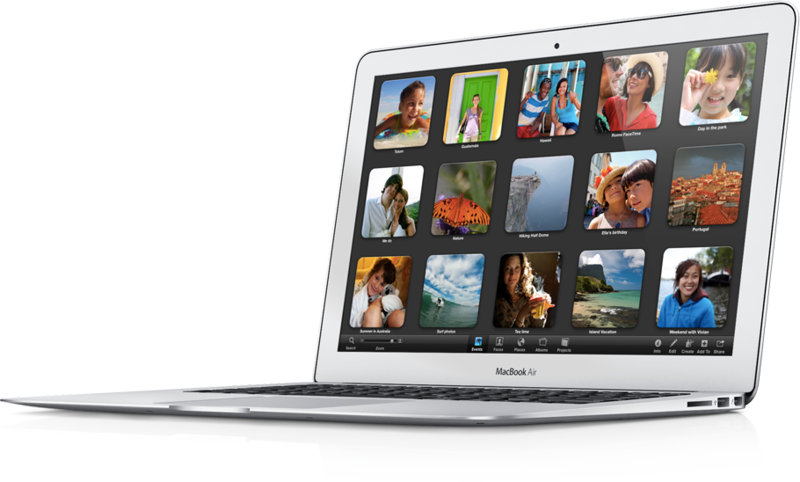 Best laptop from Apple. The best & amazing about it is its battery backup. It cannot be denied that after the release of the Mack book pros last year everybody was expecting of a retina Mack book air. The expectation seemed to build in new heights last year when the pro series came up with the slimmer faster devices compiled with a chassis of drive free functionality. But sadly though the expectations were not met until now when finally the Apple revealed the latest Mack book air series. Now with our glaring reviews we can firmly be able to judge that whether the Mack book air from the Apple has been able to stand out as per the expectations. But when reviewed closely we were not able to notify any such glaring identifiable changes which could make the Mach book air the one that we are eyeing for. The latest released Apple’s Mack book has predominantly no changes in the external section. The Mack book Air is now confirm as a minor model with no such diversions in its design in the specifications of display and layout. But that does not mean that it has no advancement at all. The Mack book is way faster and it has now the power enhanced Haswell processors with Intel inbuilt in it. This if compared can be similar with its fellow contemporaries but in power it has swathed the predecessors and its quite rich in its strength. Now let us check out that whether the 13 inched Mack book air from Apple which is priced at $1,099 with battery longevity of 12 hours is really worth while buy or not . For many people who are engrossed in the laptop for some pretty heavy hours the latest released Mack book air of 13 inches is really a thing which they will really want to cash on. So, take a look at some of the basic specifications of the device. • Design and layout: The latest released Mack Book Air if seen through a naked eye may seem that it is quite an extended model of its predecessor with no real changes in its store. In the aspect of the ports the latest released Mack book Air has side panel ports of 3.0 versions one in the right hand side and the other on the left. The Mack book air has a classical mini port for the display which is called the thunderbolt port; this is used as the external monitor function. The highlighting new feature in the design section is the addition of the twin microphones. This is a great one as during the facetime session the audible function of twin microphone will help each others in hearing you at a clarity pitch. It has been noted that not only in facetime sessions but in future with the set up of twin microphone the use of the Siri function of Apple will give in a vent. • Keyboard functioning: In the section of the keyboard function the Mack book air has made no such difference, but this is no way considered as drawback as in 2011 the Mack book series when revised their models they had made the improvisation of the backlit. This has helped to generate a great typing experience with lighter touch feel and super typing experience. Also the trackpad is kept away from making improvisations. This section has also been appreciated well as the comfortable and broad look has always been an eye of attraction. • Display: Though expectations were hyped that the next Mack book would a retina display but it has no such function. Still, it does attract with its powerful LCD screen. There are no such questions regarding its viewing angles as it seems to be a great one as always. The brightness functionality stands up to its call without any complains about it. There can be no questions regarding the reproduction of the colorization facilities as they are well guarded. The LED backlight gets a great thumps up to prove that it saves the power to a great way. Thus, we can say that though there are some drops in the expectation level but it has no such major flaws. The Mack book has only one feature missing, that is the touch pad, and if this feature was there then this laptop would be a great one to have in your tech zone.